"Wow! What an view! 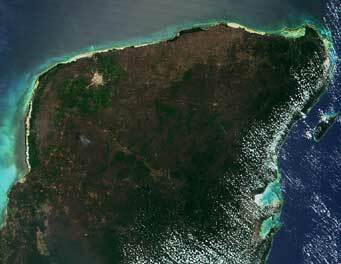 This beautiful image of the Yucatan Penninsula in southern Mexico was taken on April 3, 2000 by the MODIS insturment on board the Terra satellite. This is a true-color image, so the green areas are forests, the brown areas are dry plants and cleared fields, and the circular grayish blotch near the coast at upper left is the city of Merida. Scientists say there is a crater here somewhere. Can you find it? Image courtesy of NASA-GSFC. When you think you have found it, click here and find out if you were right!"